Every fashion week, I look forward to seeing how fashion and music collide. And one of my absolute fav moments this year was Parisian fashion label Maison Kitsuné and Encore! Live Sessions. 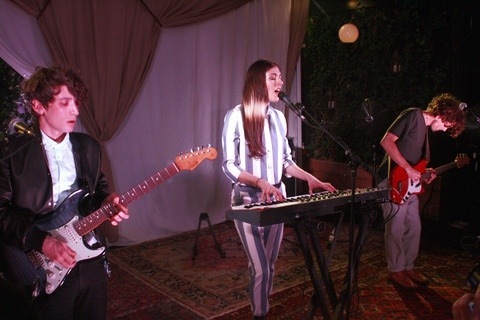 Both hosted an exclusive soirée on the rooftop of The NoMad Hotel, with live performance by indie synth-pop band Chairlift. Dressed in the new Maison Kitsuné Spring/Summer 2014 Collection, Chairlift provided a chic soundtrack for the city’s finest fashion insiders. Partygoers sipped on ABSOLUT cocktails with Maison Kitsuné co-founder Gildas Loaëc. Industry favorites Lynn Yaeger and Annabelle Dexter-Jones were also in attendance, amongst others. Beautiful pieces and beautiful music — perfect event! Take a listen to my fav Chairlift songs. I describe their music in three words: electro ethereal pop.